Tender Care was founded for the purpose of providing ethical, responsible home care to the infirm or elderly client who desires to live at home rather than enter a Nursing Home or Assisted Living Facility. We, at Tender Care, Inc. believe that home care services provided by medically oriented caregivers with a focus on client dignity, respect and independence will not only increase the life span of the client, but also allow them to experience the greatest quality of life. We offer a comprehensive home care service for patients with multiple needs. Only one phone call is needed to arrange home care nursing. 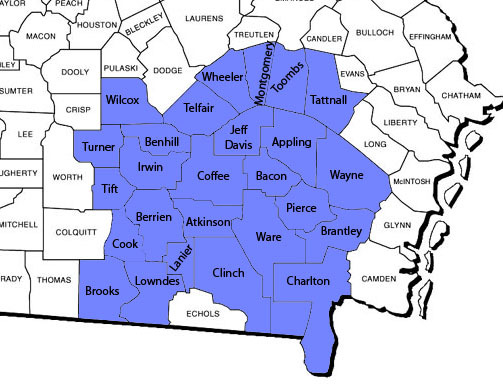 With offices in Douglas our service area includes most of South Georgia. In today's healthcare market, it pays to have an advantage. Our professional staff is confident in supplying the specialized healthcare needs of each individual patient. We have registered nurses on staff to answer any questions or concerns you might encounter. Tender Care, Inc. Care Givers are available to you anytime. Services provided by the hour up to 24-hours per day. We provide services 24 hours a day, seven days a week. Our office hours are Monday through Friday, 8:00am to 5:00pm. In addition, we provide 24-hour availability – just call us at (912)384-8802 or 1-800-375-5185.